Fresh, Homemade Ricotta, step by step — so simple! I realized after I posted my little lemony ricotta cheesecakes that I got a little ahead of myself. I’m not sure why I didn’t post this first, but no matter –I hope you’ll be as excited about this as I am! See, for the past month or so I’ve been making little batches of homemade ricotta cheese. And I will tell you this: it is DEAD easy. All you need is some milk, heavy cream, a lemon, and some salt; plus, a colander to drain the cheese. It takes all of about 15 minutes, and the result is so much better than anything you buy in the store. It’s creamy, has a wonderful mild flavor, and lacks the watery runoff that so many of the supermarket brands of ricotta have. I’ve been using it on pizzas, in the ricotta cheesecakes, mixed with some yogurt, and in a few other dishes that I’ll post over the next few days. I mentioned in my “5 things” meme that cheesemaking was a hobby I eventually would like to take up — I’m not really sure why it took me so long to start doing this ricotta, since it’s so easy! I came across the recipe by accident one day when I was browsing epicurious (this eats up a lot of my time, I’m afraid). You can view the original recipe here, but I thought I’d take you step by step through the process in pictures. (a) I haven’t yet tried it with anything other than whole milk. If you want to try a lower-fat version, some of the people commenting on the recipe said they used 1% milk successfully. I usually make this cheese when I have whole milk leftover from another recipe, since we only drink skim milk. (b) The recipe as listed on epicurious makes about 2 cups. I’ve been halving the recipe to make smaller batches, as I find it’s a bit easier to drain in my small colander, and it gets used up more quickly this way. The recipe I list below is the halved version. Now I add the milk, cream, and salt to a medium saucepan and heat it over medium-high heat, stirring occasionally with a rubber spatula to prevent the bottom from scalding. I have the lemon juice in a little bowl nearby. When the milk reaches a steady simmer, I dump in the lemon juice and give it a quick, gentle stir with my spatula. You’ll see it immediately start to curdle; I usually turn the heat down a bit so it doesn’t reach a hard boil. The first time I made this, I followed the directions of the recipe and stirred it continuously for 2 minutes after adding the lemon juice, but I found this created harder, rubbery curds. Now, I just add the lemon juice, quickly give it a gentle stir just to combine, turn down the heat slightly and LET IT SIT for about 1 minute. I’ll then give it another gentle stir with the spatula, and let it sit for another minute. After about 2 minutes of gentle simmering, most of the curds will have separated from the whey. Now you’ll dump this mixture into your colander. 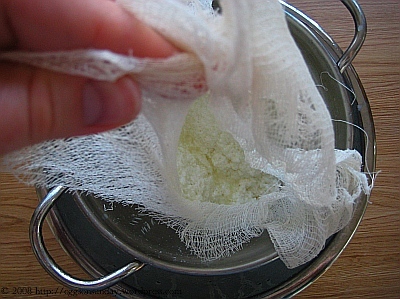 You can pick up the cheesecloth and tilt it a bit to help drain off the whey. Let the curds drain for 1 hour in this colander at room temperature. Transfer the cheese to an airtight bowl and keep it in the fridge. Like I said above, I have a few recipes to share with you that I’ve made using the homemade ricotta…so stay tuned for those over the next week or so! The ingredients listed below will make about 1 cup’s worth of ricotta, which is half the original recipe. It doubles easily. Combine the milk, cream, and salt in a heavy saucepan. Separately, line a colander with cheesecloth and set it in a large bowl. Measure out the lemon juice and set it aside. Bring the milk mixture to a simmer over medium high heat, stirring occasionally with a spatula to prevent scalding. Once the mixture has reached a steady simmer, add the lemon juice and stir gently with the spatula — quickly, just to blend. Let the mixture sit for about 1 minute, turning down the heat slightly so it stays at a simmer but doesn’t reach a hard, rolling boil. Stir with the spatula after about 1 minute, then let it sit another minute until it looks like most of the liquid has separated into curds and whey. Drain the mixture into the cheesecloth-lined colander set over a bowl, and let it drain at room temperature for 1 hour. Transfer the ricotta to an airtight container and refrigerate. Wow! That seems so much easier than I thought it would be. Despite my dairy intolerance, I’ve been fussing with homemade yogurt for years and have moved on to sour cream. It seems as though home made, cultured whole milk products just “sit” with me better. A tablespoon of yogurt (natural, organic if possible, with the little probiotic beasties in them) in a cup of milk, heat it up till you can only hold your finger in it to the count of six (hotter will kill the beasties), keep pot in a warm-ish place for a day and you get yogurt. I’m scatterbrained and kept on letting the milk boil so I bought a yogurt maker (link below). Cheap, easy and effective! It’s already paid for itself and I’ve had it only a few weeks. I also use it to make sour cream: Just a tablespoon of buttermilk to a cup of milk, warm it up a bit, let it sit in the fridge a few days and voila. I also bought a yogurt strainer (I was using kitchen towels, ew, messy and gross) to make them store-bought consistency and discovered, hey, whey! What to do with the whey? Cheese? Really? Next are real cheese and bread! With GMO foods and food prices being what they are, this will eventually be the cheap way to get good organic and non-GMO dairy products, believe it or not. Also, gas prices are probably going to cause problems with distribution/supply as truckers stop turning profits . . . if you know how to make food yourself you’ll never run out, yes? Just find a local (organic if you can find it) dairy and/or mill. Ooooh, I’ve gotta try this! I didn’t know you could make ricotta right at home–fascinating! This *is* easy! Now there is never any excuse for anyone to use cottage cheese instead of ricotta just because it’s not available where they live. amy that looks so good…i am already envisioning homemade ricotta filling,for cannolis! have you ever made fresh mozzarella…not so difficult and hands-on fun! Looks like fun! Have you tried with other milks? I have goats milk and unpasteurized cows milk available locally so I’ll def give it a go. I heard its unsafe to use unpasteurized cows milk. If you try this would you kindly let me know if its safe. Is it the same as RAW cows milk? usually it is the same if it is also nonhomogonized. Because you do scald the milk it is probably safe. I drink only raw milk and I have never gotten sick! I have had milk straight from the cow, it is delicious. As long has you have healthy cows, I don’t forsee a problem with it. Wow, I can’t believe it actually looks pretty simple to make cheese, at home! Very impressive, it must be so delicious on pizza! 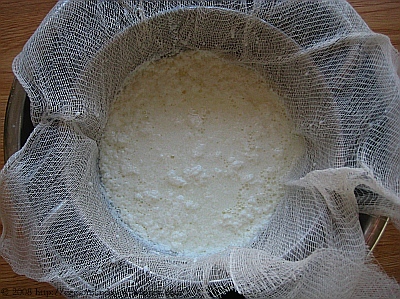 I’ve been meaning to make ricotta, too, ever since I saw an article about it on Donna Hay magazine. I just need to buy muslin. I will give this a try next time I have whole milk leftover too. THIS IS A LOVELY RECIPE I’VE TRIED IT BEFORE!! May I make a suggestion? I make this kind of cheese often and usually don’t use cheesecloth. Take a paper towel and line your colander. 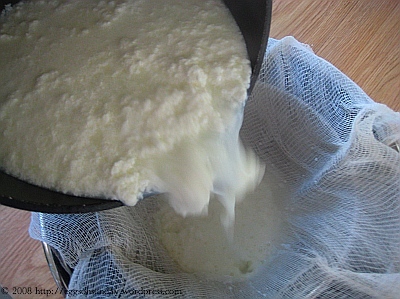 Wet the towel so it will stay in place when you pour in the curds and whey. It works perfectly and you just toss the towel after you dump the cheese in a bowl. Excellent job with all the photos, by the way! hi, lovely recipe….I have a question here..
what is the use of salt in this recipe? is it to make the whey ..bit salty? I was planing to make ricotta and use it in Indian sweets. I will wait for your answer. Good illustrations and recipe. Indians use this all the time to make paneer. Lakshmi I wouldn’t use salt if you plan to use for sweets or for paneer a little salt makes it more flavorful. But seriously the ricotta cheese is not the same as this- I don’t really know may be some authentic Italian can answer. I’ve been wanting to try making my own for awhile now. Now I know I will for sure. Thanks for the motivation. Yep, I just made it recently! So much lighter than store bought! I just made some, it looks great! 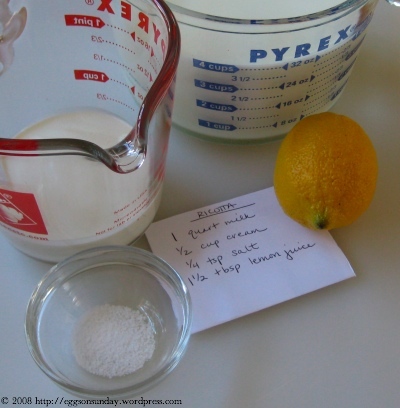 Did you use bottled lemon juice, (aka ReaLemon) or fresh squeezed lemon juice, I wasn’t sure, so I used a combination. We’ll see how it turns out. I don’t think I got as much curd. My 2 cents — I’m still experimenting, but so far I’ve found that stirring while adding the lemon juice (or vinegar) results in a stringier curd than letting it sit. If you press the “stringy” results, you get something similar to string cheese, panir, or fresh mozarella (although this version doesn’t melt). I’ve used non-fat dry milk exclusively, with great results. Tastes amazing, and is amazingly inexpensive. I can’t wait to try adding herbs* or caraway seeds, etc. One could probably add some carrot juice to make it orangy if wished. This is such a superior alternative to the supermarket Frankenfood version of non-fat “cheese”! *One recommendation also is to make a strong infusion of the herbs, and then add the “tea” to the milk before making the cheese. Haven’t tried this yet, but it sounds reasonable. 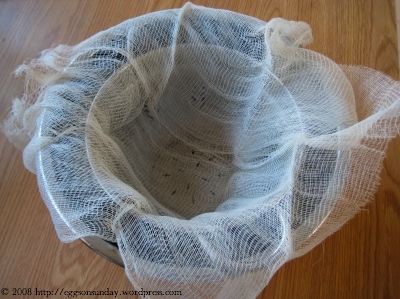 P. S. you can also line the collander or strainer with a paper coffee filter. Give it a good rinse (especially if it’s white paper), and you’re good to go. Hey there! I just made this and your instructions were very easy to follow, and it was too easy to make. I’d never thought of making it myself until I read this. I jsut may give it a try. I hope I’ll I have time to come back and read more of your blogs soon. Love your site. I didn’t dream you could make ricotta. My husband does the shopping and it is so much easier making things at home than explaining exactly what weird things I need for recipes. Thanks. Nice job! Didn’t know that it was that easy. Can you tell me what the calorie count is in the home-made ricotta cheese? Is it the same like the one in the supermarket? Christina – sorry, I’m afraid I don’t have a calorie count on this for you. I will never buy store bought ricotta again. This took me less time than going to the store to buy it and it is absolutely divine! Thanks. Am just back to my pc after ‘hanging’ my version of Ricotta. I searched the web all morning reading the various versions and came across your site – loved the pics – for first timers it really helps! I made up the gallon of milk using UHT box milk (sometimes our fresh milk is adulterated so I tend to buy the box stuff if there is no buffallo available in the village) I used a ltr of cream and the balance of box milk – I stired in a tsp and a pinch of citric acid and left out the salt. I stirred continuously and used a thermometre but somewhere around 170 it started to resemble a volcanoe about to burst. It had thickened up heaps and had curdled but tiny lumps. Let it stand for about 30 mins – strained (throwing the whey in the compost) and it is now in a purple bit of organza as I didnt have muslin, kitchen roll or coffee filters! Looked fab! (Paneer is very different and you boil the milk first then squeeze lime and it forms a big lump which you can slice – it is not creamy – more like feta than ricotta, plus when u cook it – it doesnt melt). Thanks for the photos – they really helped. Add the salt afterward then you can use this for both sweet (cheesecake) and savoury dishes! Happy Cooking and eating!!! I can tell you there isn’t a decent Italian restaurant here in Colombia that can satify my desire for a good Italian lasagne. The lasagne here resembles a hamburger pie with tons of mozzarella cheese on top. The high end supermarkets here do import riccota but they charge over $10.00 for a 14 oz. container. Making ricotta from your recipe was so easy and more importantly, less expensive. About $3.00 for the same amount and it is absolutely perfect for lasagne. I love the reaction from my Colombian friends when they first try real Italian lasagna. Never any leftovers! Thank you for posting your instructions….. I used this recipe to make ricotta gnocchi! Fabulous and easy! Never buying ricotta from the store again! One question: do you throw away the whey, or can it be used for other recipes? I throw away the whey – I believe when you make some other cheese (i.e. hard cheeses) you can save the whey and make ricotta from it, but the whey left from making ricotta doesn’t yield much at all in the way of an additional batch of cheese. I’ve read some people use it in baking bread, to drink, water plants, and in soup – but I’ve never tried any of those things! Thanks for the recipe. I just tried it and, indeed, that’s ricotta. However, I doubled the recipe to 2 quarts milk, etc., and I ended up with the 1 cup that you say you get from just 1 quart of milk. Any ideas why such a drastic difference in yield? I am so glad I found this blog! Thanks for the instructions, which helped me enormously. The first time I made ricotta, like you I followed a recipe to stir continuously, and the results were hard rubbery bits. Your instructions resulted in a beautiful creamy product that has entered my permanent recipe list. Thanks so much! Awesome! I’ve wanted to start making my own cheese too… I think I even have the exact same little colander 🙂 Thanks for sharing! I make this quite often. I get raves about the lasagna that I make with it. Left overs make a great spread on a bagel. Good stuff. Try it. Thanks for the recipe! Looking forward to trying it out. I accidentally made ricotta one day while heating milk to make custard! Instead of (cow’s milk) cream, I used coconut cream, and voila, ricotta. Sadly I had started to throw away the curds before I realised they were yummy! Today I combined leftover whey from making labna (yoghurt cream cheese) with whole milk, got some curds. So looks like I’ve got 3 methods to compare- it’ll be fun! I just tried this recipe and yielded about 2/3 cup of the creamiest ricotta I’ve ever seen! I’ve made this ricotta a couple of times before and it was great. This time I added the lemon juice and nothing. No a curd to be found! What went wrong? If you use whole milk, then you can skip the heavy cream. Ricotta is a delicious cheese. This is the same way to make Paneer, and Indian Cottage Cheese that is fryable and delicious in certain curry dishes. I’ve used 2% to make Paneer for years! You can either compress the cheese immediately after draining it and then frying it lightly, or you can use it crumbled in some Indian dishes, too. 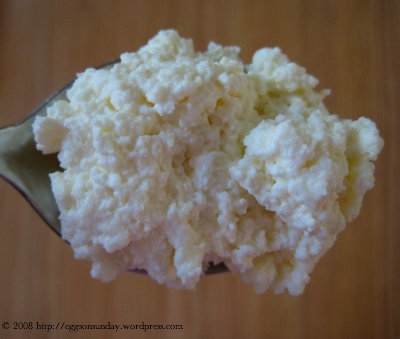 Oops, a typo…AN Indian Cottage Cheese…sorry. Great blog and pictures! I’ve tried homemade ricotta so many ways and I have found that the one made with whole milk is the best. I’ve also made it with Lactaid Milk and it comes out great. I use paper towels instead of cheesecloth; only because the first time I did it I improvised and it worked nicely.